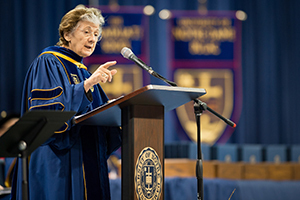 Rita Colwell, the first woman to direct the National Science Foundation (NSF), told the University of Notre Dame’s Graduate School degree recipients during Saturday’s (May 14) Commencement Ceremony that they will not lack for challenges, excitement or gratification and that she is confident that they can change our world. Colwell, a molecular microbiologist whose research focuses on global infectious diseases, water and health, delivered the commencement address during the ceremonies, where the University recognized and celebrated the recipients of 214 doctoral degrees, one doctor of musical arts degree and 490 master’s degrees. Colwell noted that she was one of the first scientists to develop software to analyze bacteriological data and that the use of her computational tools to study biology played a major role in establishing the field of bioinformatics, a key area of scientific research today. Colwell told the graduates that they are living in a “golden era” of scientific discovery, when advances are being made at a time when they can be used to solve the most pressing problems facing human civilization, including poverty, climate change and strife among nations. In concluding, Colwell, currently a Distinguished University Professor at both the University of Maryland and at Johns Hopkins University Bloomberg School of Public Health, shared a secret with the degree recipients. “Do not forget the lessons you have learned here at Notre Dame,” she said. “I’m sure you will reflect on some of those lessons, but I will let you in on a little secret: the truth is, you don’t yet know which of those lessons will prove to be the most important, the most enduring. You can’t know — not yet. You may not know until many years in the future, when you have the chance to think back on your university days. You will be surprised which lessons proved to be the most significant and influential. The recipients of several Graduate School awards were also recognized during the Commencement ceremony. Reka Albert, distinguished professor of physics and biology at Pennsylvania State University, was recognized as this year’s Distinguished Alumnus Award winner for her pioneering work in network theory. She received her doctorate in physics from Notre Dame in 2001, where she was advised by professor Albert-Laszlo Barabasi. Her current research extends far beyond traditional disciplinary boundaries, with investigations as diverse as the vulnerability of power grids to the dynamic modeling of biological networks. The top graduating doctoral students in the humanities, social sciences, science and engineering were honored with the Eli J. and Helen Shaheen Graduate School Awards. Michael Gonzales, a computer science and engineering Ph.D., was the recipient for engineering. He was honored for his pioneering research in health informatics in which he designs and tests tools to improve decision making by physicians in high-demand hospital settings such as intensive care and surgery. In the humanities, Kara Donnelly, an English Ph.D., was the recipient. Donnelly was recognized for her comprehensive doctoral work on the institution of the Booker Prize, an award given to novels in English written in British Commonwealth countries. Mackenzie Warren, a physics Ph.D., was the recipient in the sciences. He was honored for his research on the mechanics of core-collapse supernovae, which are the end result of the death of massive stars. In the social sciences, Nara Pavao, a political science Ph.D., was the recipient. Pavao was honored for her dissertation research that examines why voters support corrupter politicians, focusing on Brazil and then extending her argument using cross-national data. Catherine Zuckert, the Nancy Reeves Dreux Professor of Political Science, and Jeffrey Feder, a professor of biological sciences, were honored as recipients of the University’s 2016 James A. Burns, C.S.C., Graduate School Award. Zuckert was recognized for her exemplary dedication to graduate education and mentoring. Feder was honored for his remarkable vision and unrelenting tenacity in conceiving of, and successfully implementing, the GLOBES program. Jessica Collett, associate professor of sociology, was recognized as the winner of this year’s Director of Graduate Studies Award. She was honored for impacting graduate training at all points, including new approaches to recruiting prospective students, connecting new students with resources and services that foster their professional development and initiatives to keep students on track and moving toward their goals. Originally published by William G. Gilroy at news.nd.edu on May 14, 2016.